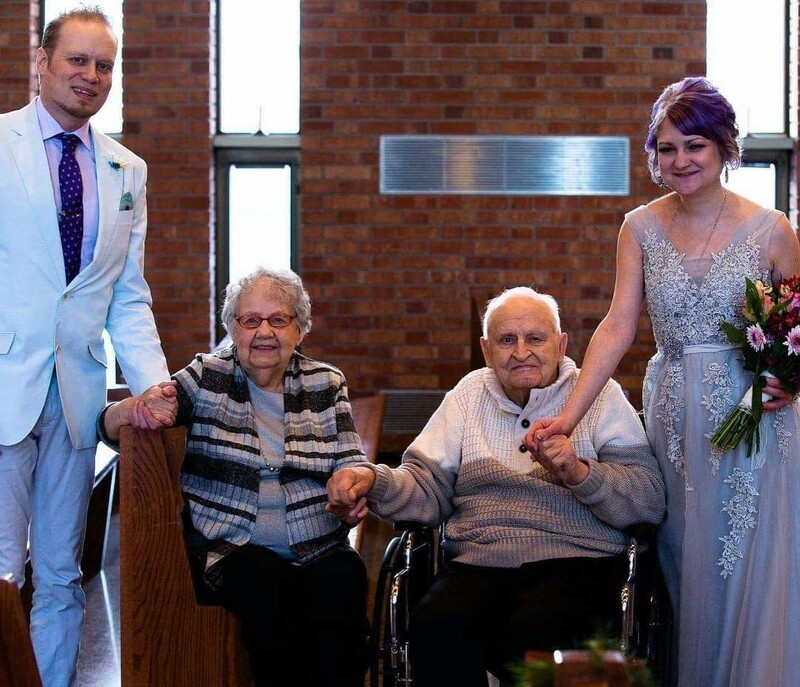 Columnist Brian Miller with his Grandma Lorraine, Grandpa Don and wife Bethany at his wedding this past December. Submitted photos. NOTE: While writing my column and jotting down random thoughts for a funeral remembrance about my grandma, Lorraine Kunnari, who early last Friday morning suddenly left us – her husband of 72 years, my grandpa Don; her 11 children, including my mom Connie, and their 11 spouses; 50 grandchildren (two deceased, including my brother Jon) and their 40-some spouses (I can’t keep track); 94 great-grandchildren (with by my best guess, another four or five on the way); and four great-greatgrandchildren – the two kind of morphed together. As my Uncle Scott summed her up in the words of his mother: “She was the nicest woman I ever met.” The following is what, by the time you read this, I will have shared at her funeral service on Thursday. Again, on behalf of the family in general and of the grandchildren in particular, thank you all for coming to honor the sweetest woman I have ever known, my grandma. It means so much to us all, especially I’m sure to the man she loved until her dying breath, my grandpa. Grandma was so sweet that she got me to do two things today I absolutely, positively do not enjoy. Dress up and speak in front of a very large audience. As I wrote this, already my heart was racing. If I’m halfway smart, I will have remembered to bring something to drink. Unfortunately, my wife left for work early this morning, so that took smart out of the equation. 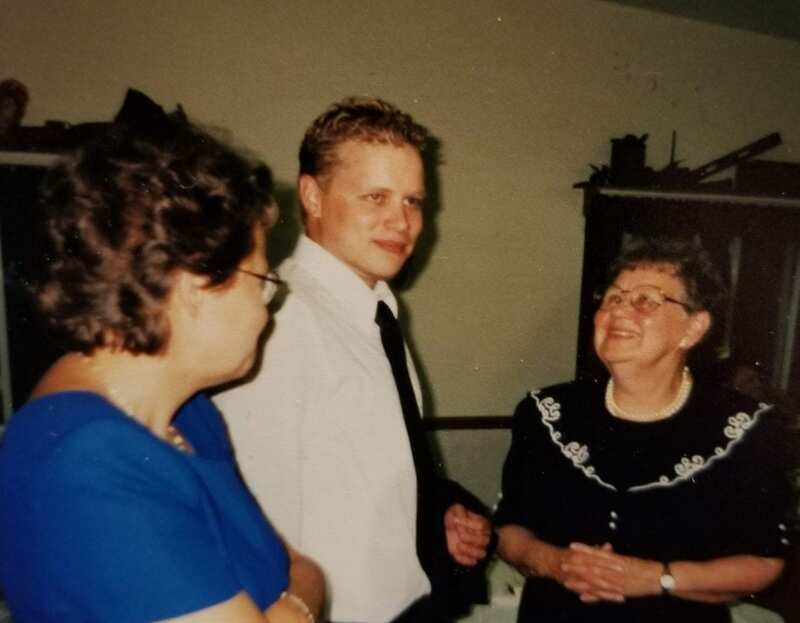 Brian and Grandma at his brother Jon’s wedding in 2001. The Friday a week before she died, Bethany and I brought Grandma and Grandpa supper. I also brought a halfdozen of my recent columns because the week before she asked for some, since she hadn’t seen the paper in some time. Last Tuesday was the last time I saw her; she had read them all. Thanks, Grandma for being my biggest fan. After visiting for a while, we excused ourselves to head for home, knowing they were tired, though they were both in really good spirits and quite cheerful that night. Grandma invited us to come back to their room and watch the Twins’ game with them – which was one of my favorite things to do with them – but I knew they were exhausted, so we prayed with them and said our goodbyes. She hugged Bethany and her last words to her were: “I am so glad you are part of this family.” What a great memory. Grandma just had that way of making everyone she met feel special. I’m positive that I’m the favorite grandchild, but as I look at my cousins, I know that most of them would argue with me on that point, because really, Grandma made each of us feel like the favorite, she made us feel so special, so loved. And not just us, she cared about the ones we cared about – our significant others, our friends. Last Friday, after hearing the news, after reality set in that Grandma had gone home, I got to thinking, and for the life of me, I could not recall a single time I ever heard Grandma utter a harsh or cross word. Now I’m certain she must have scolded and probably spanked me as a child, but I have no memory of it if it happened. It’s probably what got me to thinking I was her favorite. But the truth is, that’s how she was with everybody. She exuded genuine kindness, compassion, caring and love to everyone. It didn’t matter if I was the black sheep of the family – which I was for too long a time – she loved me through it, and she never stopped praying. She treated everyone the same, and she never stopped praying. When I felt as if I couldn’t pray, when I felt like God wouldn’t hear me, I asked Grandma to pray – for me, for my friends, for those I loved. I don’t know how many friends of mine I asked her to pray for over the years, but it was a lot. Later, she would always ask, “How is your friend (so-and-so) doing?” To all my friends out there today or who read this in the paper, my grandma probably interceded for you at some point, possibly many times. No matter who you talked about, she cared to know about them, so she could pray for them. Grandma cared about people; Grandma cared most about the eternal souls of people. That’s what I’m probably going to miss the most, to know that Grandma was praying to the Almighty for me and those I love. When you look at her legacy; there are now 50 grandchildren, 94 great-grandchildren, and four great-great-grandchildren and how many more on the way? I can’t keep track. Four? Five? Nine? She won’t be alive to see it, but kind of amazingly, the first set of twins is on the way. Julianne – Rachel’s oldest daughter is expecting twins with her husband Caleb, which is why she’s one of the only two grandkids out of 50 not to be able to be here – which is pretty cool to see, by the way. If you didn’t know, Julianne will soon have five kids under five years of age, which means she’s on a pace to pass Grandma. It’s really rather remarkable. There was a time, during the first three years of their marriage, when Grandma thought she couldn’t be a mother. And then came Ellen, and then my mom Connie, and Diane, Butch, (John Mark, who was sadly stillborn), Laurel, Dan, Kathy, Tim, Pete, Jack, Rachel. Eleven kids she raised in the era before microwaves and smartphones and a whole lot of other modern conveniences. “Imagine the loads of laundry she must have done!” is what my wife said about that. I can’t imagine what it was like for Grandma at 15, to see her beautiful mother and her uncle die in front of her in a fiery car accident, her poor brother Milt unable to pull their mom from the vehicle; I can’t imagine what that would be like or how much she carried that memory with her. I don’t know if she ever really betrayed it, not to me when we talked about it anyway. But think of it like this – if the life Grandma lived with her mom was one lifetime with her, she lived nearly five more without her. And to me, it makes who Grandma was all that much more remarkable, because she spent the last 67-plus years being the most amazing mother, grandmother, great-grandmother, and great-greatgrandmother anyone could ask for. It makes me think that Grandma’s beloved mother, who she must have missed terribly her entire life, must have been pretty remarkable too. It also makes me wonder if that’s part of why she started listening to Back to the Bible on the radio when she and Grandpa were a young married couple. Did the tragic loss of her mother cause Grandma to start searching for hope, for answers; for answers that led her to the person of Jesus Christ? I wish I had thought to have that conversation with her while she was still here, but I can’t help but think that had something to do with it. After all, God had blessed her and Grandpa with a little girl, and of course, Grandma named her Ellen. That was the name of her mother, who she so terribly wished she had gotten to know better. One cannot help but think that Grandma wanted to know that she would be able to reunite with her daughter should another tragedy befall her like the one that took her mom. I know from her testimony that Grandma realized there had to be more to life than the here and now, more to it than having a good husband and family and home. Ellen was a toddler and my mom a baby when Grandma trusted Jesus as her Savior. Grandpa did the same not long after, and their simple faith and God and His plan molded their lives and their family. They were the perfect example of God’s love in their marriage, and our family has been blessed because of their faithfulness. There are so many more things I could share about Grandma, but I probably should wrap this up. after my journalism night class at Mesabi. attention to turn it down. noticed and my aunts all sit like her. myself, and she’d still try to feed me. Christmases at the farm. Great memories. • Grandma and Grandpa were able to attend my wedding to Bethany in December. figured I’d try wear the same outfit again. Last Tuesday, on the way home I told my wife nostalgically, “I always wonder if it will be the last time I see them.” I woke up a couple of mornings later to a text from my mom that Grandma had gone home to Jesus. It happened quickly; you just don’t know. Though Grandma was 89 years old, we would often talk about the brevity of life, how fast time goes. I firmly believe that Grandma and Grandpa’s prayers for me saved my life. There was a time when I was, to use one of my dad’s old sayings, standing with one foot in the grave and another on a banana peel. I believe God in his grace heard their prayers and drew me back to His loving arms when they very well could have buried another grandchild. The hugs. Yes, I’ll really miss Grandma’s hugs. They were the best. And her prayers – those were like invisible hugs, always wrapped around you. I can’t imagine the loss for my precious Grandpa, and I pray God bears him on eagle’s wings until the joyous day they are reunited. All I know is you could never find a more perfect match than Don and Lorraine, and my heart breaks for Grandpa, who I know misses her so desperately. When I imagine her in glory, Grandma doesn’t have a fused ankle anymore; she’s not confined mostly to her chair; she not tired after walking across the room. She’s got a new body. She’s young again and vibrant and oh so happy in the presence of her dear Savior. She is there sharing stories with loved ones who went before. So while I do and will weep because I miss her, I am so thrilled for her. Grandma was so tired – she tried not to show it around her grandkids, but I could tell – and she suffered so much pain the last few years, and I believe Jesus saw how exhausted she was and called her home. Called her to rest. Thanks for bearing with me. I have a way of being long-winded when I write. Grandma never minded. Brian Miller is a longtime local writer who lives with his wife Bethany and puppy Case in Eveleth, MN. He welcomes glowing accolades and scathing reviews at brianm@htfnews.us. With all the snow this winter, he came out of retirement to shovel roofs again as he’s done during snowy winters for 25 years. If you need yours done, you can reach him at 218-410-9195 for a free estimate. Wonderful column, I so enjoyed every bit of it, so faith filled. I love that!